The osprey is a large bird that that primarily preys on fish. Its undersides are white, with a distinctive pattern of brown patches at the 'wrists' of its wings, along with barred wing tips and tail. Its back and upper wings are brown (Note that juvenile plumage is more brown underneath, and more white across the back). The osprey also has a dark stripe running back from each eye. Like other birds of prey, it has a short, hooked bill. When in flight, it has a distinctive bend in its wings, at the 'wrist' joint where the dark brown patch begins. It is often spotted when diving toward the water, where it grabs its fishy meal feet first. It may even dive completely into the water in pursuit of the prey it spots high above. Click here for video footage of an osprey diving. 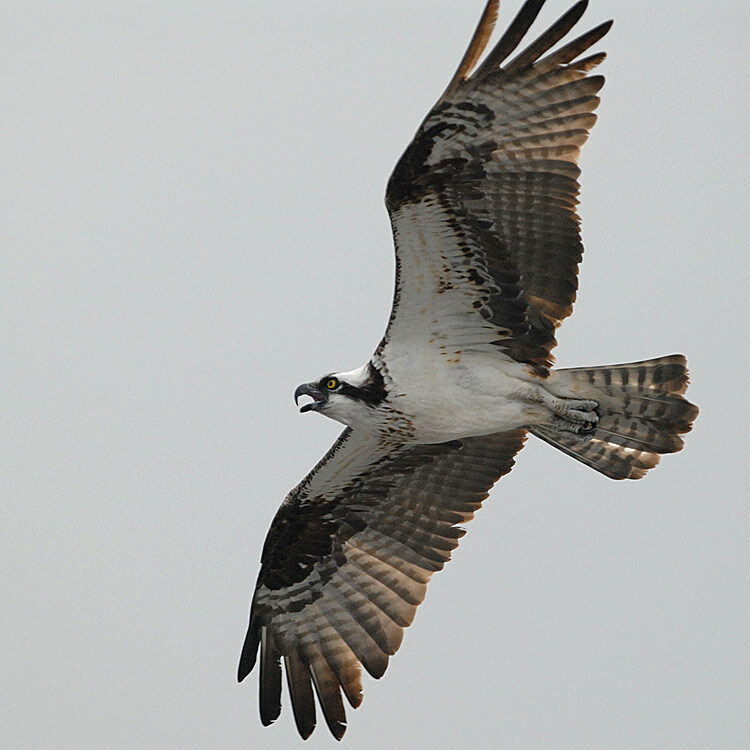 The osprey is found near shallow water bodies — either freshwater or saltwater. Nests are generally built close to water as well, including ponds, rivers, salt marshes, estuaries, and other slow-moving water bodies. This species is only present on the Central Coast in the summer months, at which time it is also found across Canada to the east coast, and south to the northwestern United States. Its winter habitat is mainly in South America, as well as coastlines in Central America and the southern U.S. Some year-round populations exist in Baja California and Florida. A juvenile bald eagle (Haliaeetus leucocephalus), especially one in its third year, may be confused for an osprey. The bald eagle holds its wings completely flat and outstretched in flight, and has yellow talons. It is also generally bigger and heavier-bodied than the ospreys, and does not generally have the dark eye stripe. 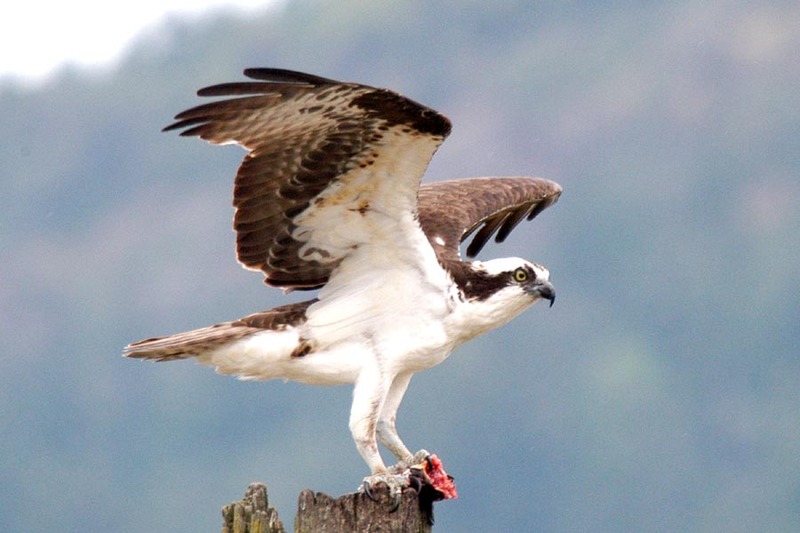 Ospreys, like many other birds, were threatened by DDT in the 1950s-70s. The species is a conservation success story in most regions, although numbers are still low in some inland areas. Another human threat has emerged, however: ospreys often use various types of man-made lines in nest-building, and these lines can entangle young chicks and either impede them from leaving the nest or cause them injury. Dunn, J. L. and Alderfer, J. (Eds.). (2006). National Geographic Field Guide to the Birds of North America. (5th Ed.). Washington, D.C.: National Geographic Society. Pp. 118-119. Osprey. Pandion haliaetus. The Birds of North America Online (A. Poole, Ed.). Ithaca: Cornell Lab of Ornithology; Retrieved from the Birds of North America Online. Accessed 30/03/2013.